Sometimes in life you have little projects tucked away in your mind. I have been pondering this project for quite sometime...always in search of a cute little bag that we could "make our own". 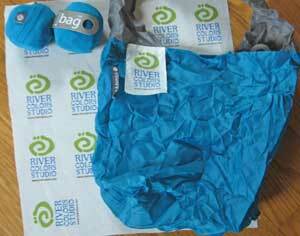 Here it is, our very own River Colors Branded shopping pod. This cute little pod can be thrown into one of your bags to be used when needed. Pop the little guy open and all of the sudden you will see our River Colors logo. We have them for sale at the store as of 9/15/12. Do your part for the environment, carry a pod!